MSNBC analyst-- and 9/11 truther-- Touré appeared on Friday's Dylan Ratigan Show to complain about the September 11th "nostalgia mill" promoted by the media. He also smeared the entire country as bigoted against Muslims. In his commentary, Touré fumed, "We're a nation that's comfortable hating all of Islam and fights against mosques being built within a certain proximity of Ground Zero. And by a certain proximity, I mean within the continental United States." He continued, "And now we're a nation with a media that wants to trot out the old stories, all that 'where were you when the planes hit' stuff? 'Remember that crazy day' stuff? Like we're in AA telling each other our stories." Why, exactly, would MSNBC bring on a 9/11 truther to complain about September 11th coverage? A larger question: Why would MSNBC employ a 9/11 truther as an analyst? Shouldn't Ratigan have explained to his viewers who Touré is? Ratigan, who introduced Touré, seemed at least somewhat uncomfortable with the topic. After the commentary, he claimed to "agree," but there were several long, awkward pauses in their exchange. Ratigan noted, "It's an interesting situation, because I just did an hour show on 9/11." 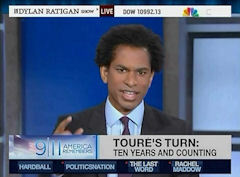 DYLAN RATIGAN: Now, with his thoughts on the tenth anniversary, our friend Touré. TOURÉ: We are once again in the midst of the 9/11 nostalgia mill, the annual ritual where print and television media churn out remembrances and images of 9/11. But, this year, the tenth anniversary, there's an extra intensity. More pages, more TV time being devoted to it as if there's a going out of business sale on 9/11 memories. I can almost see some media czar telling his troops, "All right, it's the tenth anniversary of the apocalypse, boys. This could be our last chance to use this stuff. Let's unload the vaults!" And I gotta tell you, the 9/11 nostalgia thing is weirding me out. We must remember the dead, the innocents who were in the tower, the valiant ones on the plane, intrepid and courageous first responders who went into areas most humans would run from and never came out. When I see those car window stickers that say never forget and show an image of the towers I want to salute. But this media 9/11 nostalgia isn't the same. Nostalgia is generally a wish to relive happy moments. The media's 9/11 nostalgia, is it about remembering the dead or is it like a car crash gawking situation? Is it like, when people would come to New York and want to see Ground Zero as if the wreckage was some sort of tourist site? I refuse to take visiting friends to Ground Zero to see the massive hole in the ground. It's not a tourist site. A place where many people and a part of America died. The America I lived in before that morning, before planes met towers, no longer exist in my mind or in anyone else's. We've changed in fundamental ways. We can no longer imagine a nation that would never be attacked on no longer feel totally free moving through America. We're kind of keeping one eye out for the other shoe to drop, for the next attack to come. We've been remaining vigilant because we're on the verge of another attack. We've been told that so many times I'm numb to it. Like the government is the boy who cried wolf. The America we knew died on 9/11, replaced by a nation mistrustful of its own citizens. When you go to the airport we're guilty until proven harmless, which can only be proven by getting near naked and being X-rayed and/or intimately padded down. We're a nation that's comfortable hating all of Islam and fights against mosques being built within a certain proximity of Ground Zero. And by a certain proximity, I mean within the continental United States. And now we're a nation with a media that wants to trot out the old stories, all that "where were you when the planes hit" stuff. "Remember that crazy day" stuff? Like we're in AA telling each other our stories. Yeah, I know it's traumatic. I'm a New Yorker. I smelled the smoke days after. But, are we, as media people doing 9/11 nostalgia for a good human reason like to heal the wounds that remain? Or is it a tool to get people to watch and read, because fear sells and wallowing in the deep pool of 9/11 pain is good for business? DYLAN RATIGAN: [Long, awkward pause.] I agree with you. It's an interesting situation, because I just did an hour show on 9/11. TOURÉ: Do the people want it, or do we want to give it to them? RATIGAN: I don't know that there's an answer to that question that I have. It may exist. I don't know it. RATIGAN: I do, however- I do, however [long pause]- I think that at least in the our case, and it's easy to think that, that we try to have a conversation in a way that moves things forward. Whether it's the education, with Edie Lutnick and that sort of thing, but I am hopeful that your words go to [long pause]- I'm not even going to bother. We're on an attention based economy. Things accumulate attention will get programmed on television. Whether Kim Kardashian, the hurricane. RATIGAN: 9/11, The Super Bowl. TOURÉ: And this is going to get attention. RATIGAN: And that makes money for media companies. TOURÉ: But if we had done, you had done a normal show, talking about the banks, the jobs, the thing us normally love to talk about, would people have said, he's not talking about 9/11! My needs are not being sated"? I don't know. RATIGAN: Me neither. [Very long pause.] It's nice to see you though. You've got a book out. We've got to talk about that sometime.